Baby Kassie went to the vet to get her teeth cleaned on Wednesday. 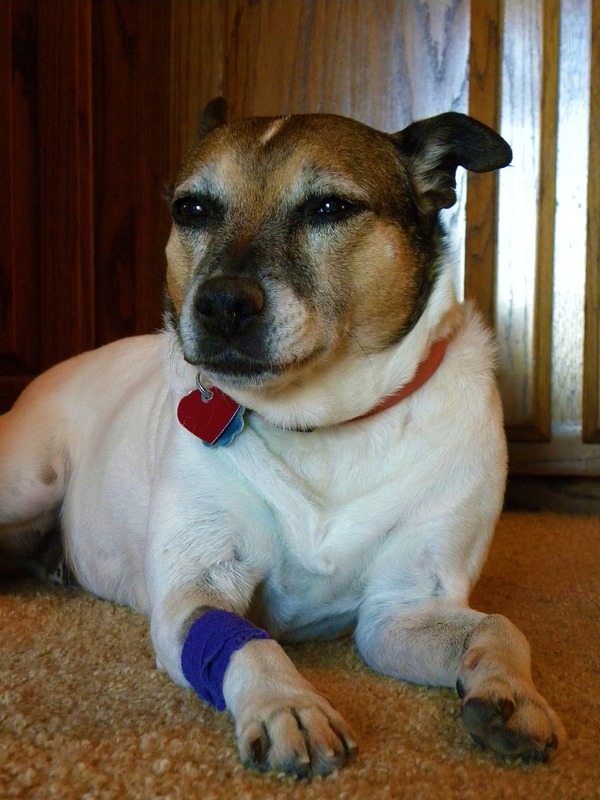 She came home Wednesday afternoon with a purple bandage on her leg and two fewer teeth. 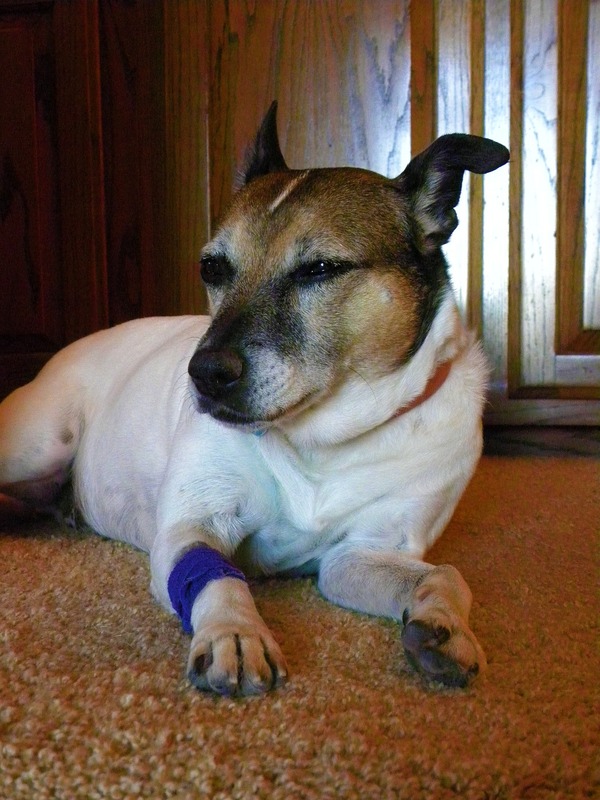 From both the effects of the anesthesia and her pain medication, she was very groggy. The important thing was that she was comfortable and feeling no pain. When her eyes started to close and she started leaning over, I knew she was alright. With tons of cuddles and lots of coddling over the last couple of days, she’s doing great. Thanks to C and Wilbur in WI, Kassie even had ice cream for dessert after breakfast this morning. Kassie appears to be in her very own alternate universe. Happily so. 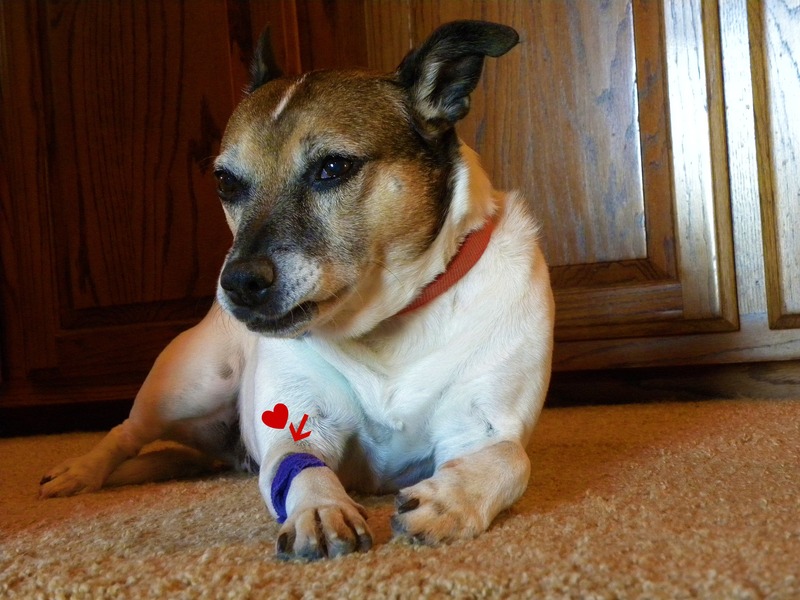 Max came home after his “dental,” and a few extractions, and ripped into his dry kibble. I don’t know if it was the pain med, or just the resilience of animal acceptance of discomfort. 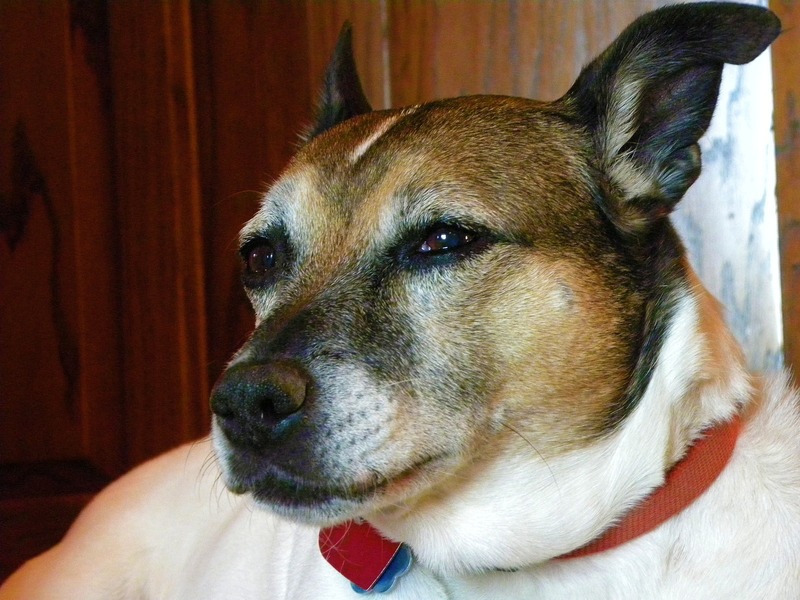 She looks like she could be a not-so-distant cousin of my Jack Russell Terrier mixes. If so, don’t be surprised if she’s blessed with breath that could stop a train. Both my two little dogs have HORRIBLE breath. Awwww, please give her a hug from me. Our soon to be 9 y/o JRT needs a trip for a pro cleaning as well. I’m always nervous about the anesthesia… but seems like Kassie is doing great! The first photo cracked me up! Feel better soon, Miss Kassie. But oh what a pretty smile she will have now! And sweeter breath too! I’m glad she’d doing well. I hate taking them in for ‘elective’ surgery too. I hope you saved the teeth and put them under her pillow. Awwww, feel better soon Kassie. I hate going to the dentist. Glad she’s doing okay. I had to take Bossman in and the med’s they put him on keep him groggy… can’t wait until he’s done. I miss his crazy self! Harry, my little Schnauzer, had 3 teeth pulled last year. It was SO quiet at our house until the drugs wore off. 🙂 The upside is that now his breath is way better! Poor little spud. I hate it when my critters have to undergo surgery of any kind. Better that she not suffer from a toothache though. Big hugs & cuddles. Aww – give her a soft doggie cookie from her Tia Winter in Texas! When our little Miniature Poodle Nikki had to have some teeth out we were told not to let him have anything to eat or drink for several hours afterward to make sure the anesthetic was fully worn off so he could swallow safely and not aspirate anything into his lungs. Well, he was more concerned about being HUNGRY and THIRSTY than about any pain or grogginess and couldn’t understand why we wouldn’t give him what he so clearly was asking for. He finally gave up on us and asked to go out. He used to go out on his own and bark to be let back in when he was done. A few minutes later, when he hadn’t yet asked to come back in, I went to investigate. I found him with his head buried deep in a snowbank gobbling up snow like it was ice-cream ! Needless to say he was brought in and promptly given his bowl of water.